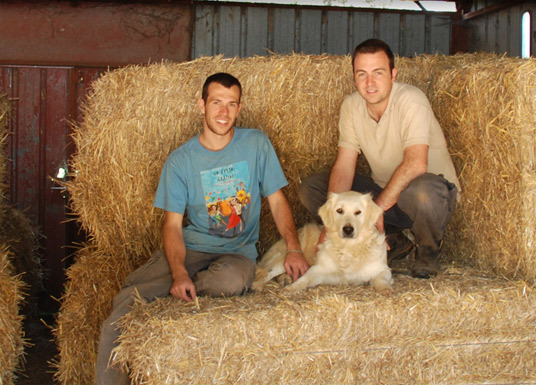 Can Xicoy is formed by two brothers, Ferran and Adrià Altés Espiell. We are very close, thoughtful and courageous. We have imbued with these qualities and have a deep respect for the land and the land the animals we work with..
Can Xicoy hasfamily roots in our land. The grandparents raised cows and pigs, and for many years worked delivering milk to the people who lived in the village. Over the past few years, we have recovered the original splendor of the farm, and we focused in a new product, goat’s cheese. That’s why we built our own formatgeria (cheese factory) where we work every day producing cheese with milk from our herd of goats. Every day at the Can Xicoy formatgeria requires enormous effort and focus in order to produce local products that meet our high quality standards and respect the environment. We have 400 Murciano-Granadina goats that we milk every day to provide an excellent quality milk tocreate our exquisite cheeses. We work to maintain active the land we inherited from our avant-past to grow in values and respect for the environment.